I feel a sudden clear focus and perspective. There is no time for anything inessential. I must focus on myself, my work and my friends. I know this feeling. Perhaps a bit more than I’d like. On the day before Thanksgiving, I was diagnosed with cancer. To be more specific, I was diagnosed with Chronic Myeloid Leukemia (CML). 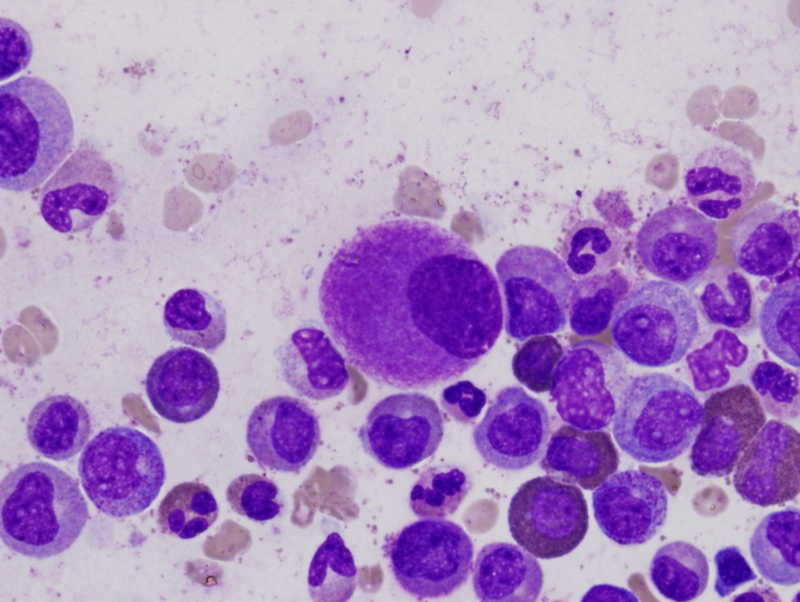 There is a treatment for CML — in fact, there’s more than one treatment option. I have elected to take a daily pill. I have been taking it for just over two months now, and all things going well, I will take it every day for the rest of my life. I just checked in again with my oncologist a week ago and my prognosis is pretty great. My body is already responding to the treatment and I’m not experiencing strong side effects from the medication. But a couple of months ago, I was a mess. Every time I remembered “I have cancer”, I thought about my two-year-old. My seven-year-old. My husband. My best friend. And thinking about my mom really did a number on me. Recalling it now causes my eyes to well up. But back to the passage in the op-ed by Sacks. When I told a friend and colleague about my diagnosis, she encouraged me to scale back on work. (She was diagnosed with cancer and tough as she is, the cancer and the treatments really wiped her out. She is in remission now.) After suggesting I scale back, she promptly said that I should do what I wanted, that everyone is different and maybe working full-tilt was actually the best option for me. That maybe I’m the kind of person who would benefit from just moving on as usual. She said that having cancer did not make her a better person or make her reconsider her life. My experience was different. Like my friend, I don’t think that cancer has made me a better person, but I have reconsidered my time. Sure, my diagnosis is not on the same level of Oliver Sacks. But my diagnosis clarified for me how I want to spend the time I’ve been gifted with. For better or worse, there are plenty of things I’ve decided I have no time for. And there are fewer things I find worth being away from my family for. Why I’m concerned about the Wednesday UCLA game at ASU. Making light of the recent brawl in South Africa’s parliament. According to the CDC, as of January 28, there were 84 people in 14 states in the U.S. reported to have measles. On the causes of the outbreak, some are blaming anti-vaxxers, a derogatory, catch-all term for people who choose — despite the litany of evidence that vaccines are safe and effective — not to vaccinate themselves or their children. Others are pointing to overseas travel as the major cause of the outbreak. Naturally, Vox.com is hedging its bets, saying it could be both anti-vaxxers and overseas travel. In the wake of the outbreak, Bard College is reportedly requiring students show proof of vaccination, get vaccinated, or stay off campus for 21 days. Beyond the Bard campus, doctors are refusing to see children whose parents refuse vaccination. Zambia has elected a new president, Edgar Lungu, of the ruling Patriotic Front party. Indian Prime Minister Narendra Modi is married, but it seems he hasn’t spoken to his wife in years. She’s waiting for his call. In the latest IMF/Ebola news, Guinea President Alpha Conde has asked the IMF to cancel its debt to aid its recovery from Ebola. Secretary of State John Kerry flew to Lagos and met with Nigerian President Goodluck Jonathan and his opposition candidate in the upcoming February 14th elections, Muhammadu Buhari. Last year, DC think tanks held more than 150 events on the Middle East where only men spoke. A good reason to switch to Lyft from Uber. Best headline of the week: Breast implant leak delays Rep. Alan Grayson’s wife’s bigamy trial. Finally, some frivolity. I don’t speak Italian, but I think this is science. At least, it involves a few things I like: Nutella, Coca-Cola and condoms. My new year’s resolution was to at least post weekly to haba na haba,* reviving the “mbalimbali”** posts — what others might call “miscellaneous” or “links I liked”. This Monday’s edition focuses on the floods in Malawi, which began earlier this month and continue to wreak havoc, particularly in the southern part of the country. The BBC estimates 200,000 Malawians have been displaced by the floods. Al Jazeera reports Malawians are angry at the slow response to the floods. The Daily Maverick (a South African newspaper) reports 170 have died. A project coordinator with Medecins Sans Frontieres (MSF, aka Doctors Without Borders) describes what he saw in the most southern district of Malawi (Nsanje) from his perch in a helicopter. An earlier MSF report estimated 20,000 Malawians were completely cut off from receiving food aid. On Tuesday, January 13, Malawi President Peter Mutharika declared a state of emergency. The most reliable, up-to-date source of information from the Malawi government is their Facebook page, where there have been (at least) daily updates. The International Charter — a multinational collaboration of space agencies in Europe and Canada — has used multiple radar satellite images to create detailed maps of the flooded areas in southern Malawi (and northern Mozambique). * Clearly, as we are almost three weeks into the new year, I’m already failing at keeping this resolution. ** In Chichewa/Chinyanja, mbalimbali has a number of meanings/translations to English. In addition to meaning “around (the sides)“, it can also mean “various” (as could siyanasiyana). Kim Kardashian in 2008. Photo by Dan Raustadt shared w/CC license. This post is co-authored with Stéphane Helleringer (@helleringer143). Meanwhile, malaria, TB and HIV/AIDS are already at pandemic proportions and I venture destroy more lives, more economies, and perhaps even more politics than Ebola. As global health researchers, we are well aware of the top causes of death in African countries and the data are clear that across the continent, malaria, tuberculosis (TB), and AIDS will each claim more lives this year than will Ebola. The World Health Organization (WHO) estimated there were 596,000 deaths from malaria and 230,000 deaths from TB in Africa in 2012 and UNAIDS estimated there were 1.1 million AIDS-related deaths in Africa in 2013. As a comparison, the total number of Ebola deaths in the current outbreak in West Africa according to the most recent WHO update (8/22) is 1,427. A new, unrelated Ebola outbreak in the Democratic Republic of the Congo has left another two people dead. But even considering there will be more deaths from Ebola before year’s end, the total number of Ebola deaths on the African continent will come nowhere close to the numbers of the top killers. But Africa is a continent – not a country. If a health problem is only prevalent and problematic in one country rather than in many of Africa’s 54 countries, does that make it as irrelevant as a Kardashian? Continent-wide metrics can mask dramatic impacts of disease outbreaks in countries or even sub-regions. If we consider Ebola in the context where it’s unfolding, it matters a great deal. By the end of 2014, it may matter even more in these countries than the other infectious diseases mentioned by Blattman. Counting deaths is hard. There are virtually no real-time mortality data in these countries outside of the Ebola case count. What we know about mortality levels and causes in Guinea, Sierra Leone and Liberia comes either from censuses (conducted every 10 years) or from surveys conducted only every five years or so or from statistical models used by the United Nations and other organizations. 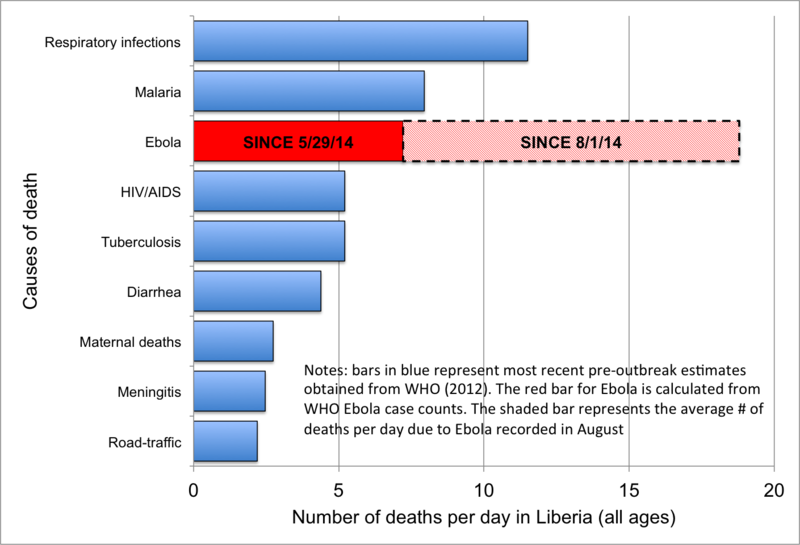 So we used the 2012 estimates for the leading causes of death in Liberia published from the WHO to put the current Ebola-related mortality in perspective. It shows that, since 5/29, the daily number of Ebola deaths is comparable to the daily number of malaria deaths (approximately seven per day) prior to the outbreak. The daily number of Ebola deaths recorded by WHO has been increasing steadily: in August, it reached an average of 18 deaths per day. This is higher than daily averages for any other cause of death in the country. And it seems to continue climbing (see figure below). Maybe a reader will be suspicious in reading too much into our daily death rate graph since these data may be capturing a temporary spike in the number of deaths. Over an entire year, the “big killers” that matter could still very well dwarf the total number of deaths due to Ebola. But the current Ebola outbreak is not going away without a fight. The international director of Doctors without Borders said recently that the situation is spiraling out of control in Liberia and Sierra Leone. The outbreak has had a slow and unimpressive response from governments in the affected countries and from the WHO. The heavily affected countries have incredible health care worker shortages and, as more health workers get infected, there will be even fewer to care for those who become sick with Ebola. Just today, the WHO announced it was temporarily pulling its health workers out of Kailahun in Sierra Leone after one of its staff members contracted Ebola under incredibly challenging working conditions. So, how many deaths from Ebola can we expect by year’s end under these conditions? To try and answer this question, we did some simple arithmetic: at a rate of 18 deaths per day (i.e., the average number reported for August so far in Liberia), it will only be 10 days until Ebola has killed as many people as road-traffic accidents usually kill in the country in an entire year. It will be 20 days until Ebola reaches the yearly level of maternal deaths; 70 days until it reaches the number of deaths from HIV/AIDS deaths and 125 days (i.e., before the end of 2014) until it reaches the estimated annual number of malaria deaths in the country. And of course, these “projections” rest on the very optimistic assumption that the public health response will be able to maintain the number of deaths due to Ebola at 18 per day. In recent days however, the daily number of deaths seems to have been rising quite sharply over time. The number of Ebola deaths may thus catch up with other causes of death this year much sooner than we just calculated. We have not calculated similar measures for Guinea or Sierra Leone – but given the wealth of publicly available data, we hope others will. Based on reported figures, the outbreak appears better controlled in those two countries and the number of Ebola deaths may not catch up with other causes of death like HIV/AIDS and malaria. It might also be instructive to consider the three countries together in a comparison of the impact of the major causes of death. But one should still be cautious in sub-regional comparisons. These, too, can be misleading. For example, The Economist called Ebola a “small-scale killer” when comparing it to other infectious diseases in the four affected countries: Guinea, Liberia, Sierra Leone, and Nigeria (at the time of publication, there had not yet been news of the unrelated outbreak in the DRC). The inclusion of Nigeria in The Economist’s figure, however, biases the assessment of the scale on which Ebola strikes, for two reasons. 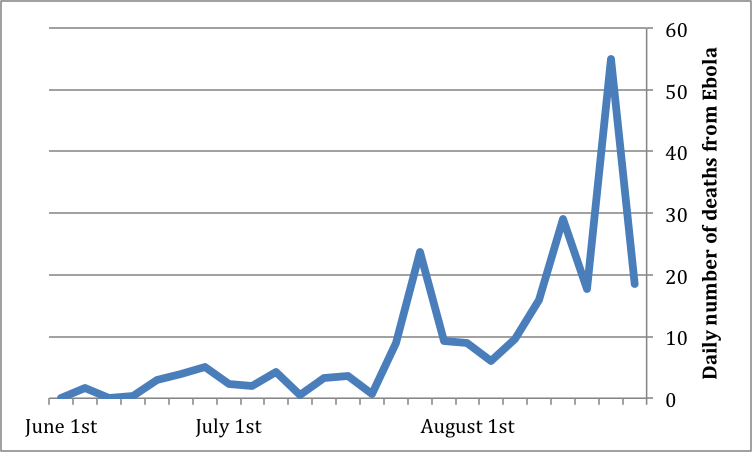 First, Nigeria has experienced only a very limited number of Ebola cases: 11 infections resulting from one recent “importation”, at the end of July (i.e., contact with an infected traveler, Patrick Sawyer, who flew to Nigeria from Liberia). Later, two infections resulting from contact with patients who came into contact with the index case (for a total of 14 confirmed Ebola cases) were also recorded. Second, Nigeria is also the most populous country in Africa; its population is more than eight times larger than that of populations of the other affected countries combined. As such, any estimates of deaths per day that includes Nigeria in a sub-regional analysis will be heavily influenced by the data from Nigeria. Despite the very exact counts for Ebola cases published with regularity by the WHO, these cases are very likely an undercount. The WHO even stated recently that their estimates of the number of Ebola deaths likely underestimate the scope of the outbreak. So if that is the case, Ebola may reach the level of other causes of death even faster than we calculated above. This post is ONLY about deaths. Ebola has taken a much larger toll on these countries than through deaths alone. Think of the effects Ebola is having on the local economies in the most heavily affected countries. HIV/AIDS and malaria are serious diseases – but they haven’t stopped commercial airliners from flying to West Africa. In sum, we know that the Ebola outbreak is unfolding in a context where there are indeed many pressing issues facing the ordinary folks who are themselves trying to navigate the outbreak. Though we appreciate considering the broader continental context, one might generate misleading characterizations of the impact and scale of Ebola when thinking of Africa as a single unit. It was flattering to be included on Vox.com‘s list, “24 Twitter accounts you should follow to understand the Ebola outbreak.” But I had a few problems with the list. Most of us included are white (I’m only half, but you get my drift). Limited diversity is not a new problem at Vox. Unlike earlier situations, however, in the space of informing the public about Ebola via social media, there are many diverse voices. Vox readers are missing out on a lot if they limit their scope to what these 24 mostly-White people have to say about Ebola. One particularly remarkable omission from the Vox list is any African journalist. All the journalists/freelancers/correspondents are white (except Sanjay Gupta). I was genuinely surprised by this since one of the best things I’ve read about the current Ebola outbreak was penned by Umaru Fofana, a journalist in Sierra Leone who has been very active in posting Ebola updates to Twitter. Another #SierraLeone doctor tests positive 4 #Ebola, Health ministry's Sidi Tunis says. Dr Modupeh Cole is Physician Specialist @Connaught. Part of the problem with Vox’s list is that it is limited to Twitter. I suspect like in many African countries, Facebook is more popular than Twitter in Ebola-affected countries and so including Facebook pages expands the range of topics and issues than we would see on Twitter alone. For example, the Sierra Leone Ministry of Health and Sanitation does not have a Twitter feed, but they have been very consistent in disseminating information on their Facebook page.